Yesterday, a colleague brought to my notice, an offer from a leading Android Tablet manufacturer. The sales promotion offered the Tablet at a significant discount and also included a number of freebies such as a bluetooth headset and almost about Rs 4,000 worth of movies and games to download. * Apple’s iPad Shipments, Market Share Surge, IHS Reports: After testing initial success and Apple consistently lost the market share (which was obvious considering that they created Tablet market segment!) till the end of 1st quarter of 2012. However, Apple arrested the decline and showed growth in Q2 of 2012 when their market share improved from 58% to about 70% after the launch of “The New iPad”. * As Tablet Race Heats Up, Apple May Try Smaller Device: Many newspapers and journals are now speculating that Apple is expected to launch a 7″ tablet in Q3 or Q4 of 2012. * Microsoft announces the launch of Surface Tablets: Tablets will be launched in October and initially will be available in 2 models, depending on the version of Windows 8, the tab will be running on and the processor (One with Windows 8 Pro running on Intel processor, while the other on Windows 8 RT running ARM processor). Incidentally, I also had a presentation from and discussion with Microsoft team on Windows 8 and could assess the impact of the OS & Surface Tablet on corporate IT landscape. 1. Microsoft is positioning its device as a single personal device unlike other Tablets which typically act as an additional or supplementary device to the Desktop PC or Mac. Considering this as well as its dominant position in Desktop OS segment (92% market share, source: NETMARKETSHARE), Windows will emerge as a dominant player in Tablet and Tablet OS market. 2. Corporates will more likely standardise on Windows Surface or Windows OS Tablets for their employees rather than other Tablets considering the compatibility of Apps between Desktops and Tablets running on different versions of Windows 8. 3. Apps are here to stay, which means that IT department of organisations will have have to maintain multiple versions of Customer and Partner facing apps even if they standardise on Windows 8 as OS for their employees. 5. Most of the international and marginal players will not be able to move beyond their niche. 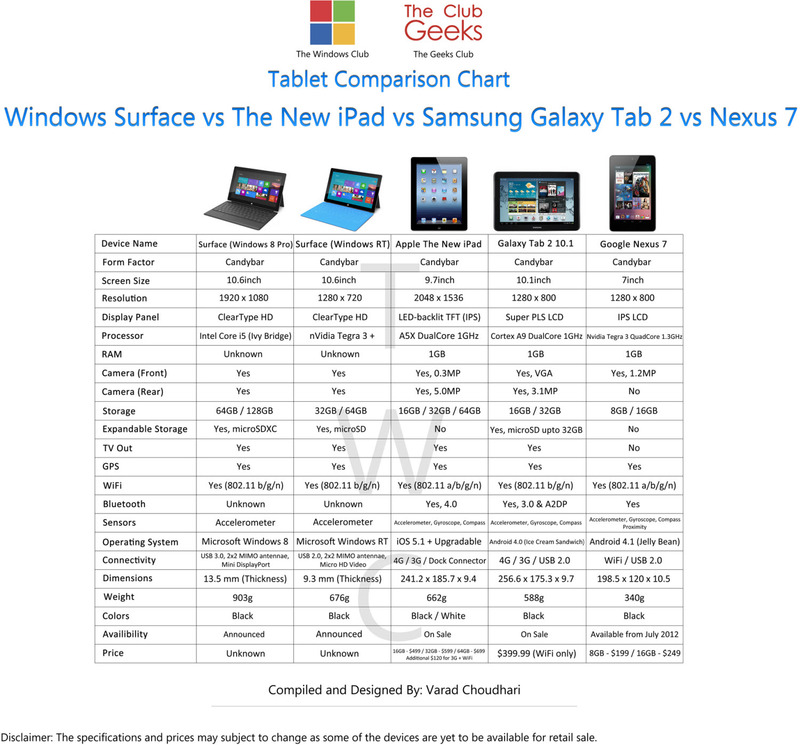 Ultimate fight for supremacy over Tablet and Tablet OS market will be between Apple and Microsoft, with Android being a distant 3rd player. 6. MDM (Mobile Devices Management) software is likely to emerge as a very flourishing business segment and we will see more players entering this segment. 7. Adoption of Web Portal technology as an enterprise application segment is likely to decline. 8. Sale of Desktops and Laptops may see decline, although desktop usage will continue in those cases where complex client end computing is required. 9. Price wars are eminent. 10. It will benefit to be a customer! What is your take on the future? Would be glad to hear from you.